These are delicious and very quick to make. Ideal side dish. Halve each potato lengthwise, then cut each half lengthwise into 4 wedges. Toss potato wedges with oil, salt, and pepper in a 17- by 11-inch shallow baking pan (about 1 inch deep) and arrange in 1 layer. 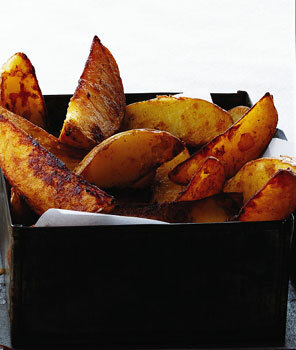 Roast potatoes, turning over once, until golden brown and cooked through, 20 to 25 minutes. Drizzle edible gardens Garlic & Rosemary Reduction on potatoes and shake pan to distribute evenly. Roast another 3 mins to heat up the reduction. Salt to taste.